Indochina Junk is cruise Operators in Halong line operating a variety of traditional junks, as well as contemporary boats in the scenic waters of Halong Bay, a UNESCO World Heritage site in northeast Vietnam. Tourists come from around the world to see Halong’s unique emerald waters punctuated by limestone towers covered in rain forests. 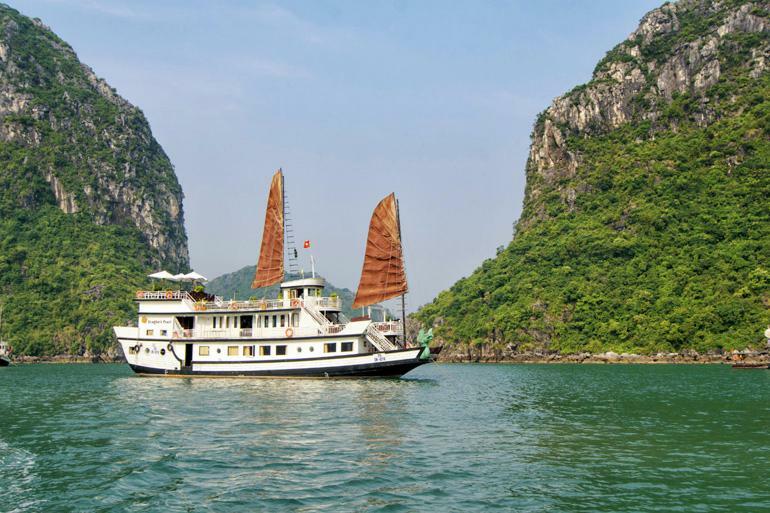 Given its popularity, there are a number of cruising companies in Halong, but Indochina Junk also offers cruises that venture off the beaten path into the nearby and untouched Bai Tu Long Bay. Indochina’s fleet ranges from the Princess Junk, which accommodates two, all the way up to the Dragon Legend Cruise with twenty-four luxury cabins. The cruise lengths also vary, from one day to four days and three nights. Indochina’s crew, who were methodically trained to reach the highest level of professional hospitality, with the heartiness and knowledge by nature, shall deliver nothing but excellence. The Indochina Junk, since its early establishment, has been recognized as the Top 10 Cruise Operators in Halong Bay in 2008. L’Amour Junk, formerly known as Princess, is considered the best one of Indochina Junk’s fleet for a romantic trip for couples (especially, those who are in a honeymoon). Designed in the form of a traditional sail-boat but operated with modern facilities, the L’Amour Indochina Junk is the chartered cruise that can get closest to every corner of Bai Tu Long natural wonders, to permit visiting pocket lagoons and witnessing a real life of rarely seen fishing villages the passengers. Once being onboard, you may hardly ignore your inner peacefulness yet be ready for exciting activities throughout the journey. Offering cruise guests superior services and a broad range of amenities, L’Amour Junk is committed to ensuring that your stay is as comfortable as possible. While lodging here, guests can enjoy a coffee shop, smoking area, shuttle service, babysitting service, and executive floor. The cruise features four beautifully appointed guestrooms, each including a balcony/terrace, bathrobes, air conditioning, hair dryer, and separate dining area accordingly to the highest standard of Indochina Junk. The cruise’s host of recreational offerings ensures you have plenty to do during your relaxed and hassle-free. Prince I with 2 cabins, perfectly suitable for a family including parents and children enjoying the magic of Halong Bay together. With a private pier, guests avoid the bustling main port and allows guests to sail the emerald waters in style, or spend the night in a quiet and secluded location in Halong Bay. 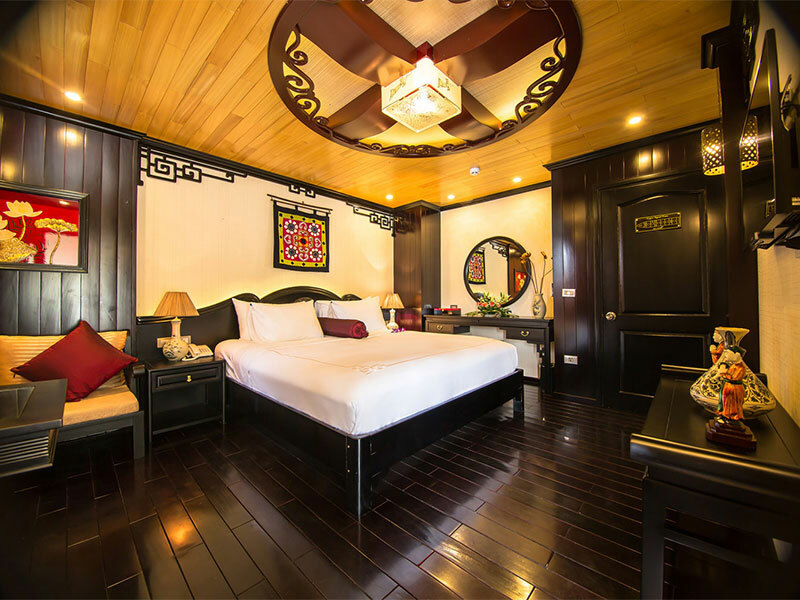 Traditionally decorated cabins, using teak and oak paneling and hand-crafted furniture, make for cosy retreats and come with sea view windows so you can appreciate the natural beauty of Halong Bay from the minute you wake up, and leisurely watch the stunning scenery passing by. Above all,the crew, with warm hospitality andmeticulous attention, will ensure a comfortable stayas well as enhance your cruise experience.You’re going to love the heartily atmosphere and pleasuring trip on board. Modelled on a 17th century pirate ship, following the same style of a legendary Chinese junk which used to run from Singapore to Northern China, the Red Dragon Cruise took four years to build and was operated in 2008 with their sole travel routes to “off-beaten track” Bai Tu Long Bay, by the Indochina Junk. Red Dragon is complete with 5 deluxe cabins and 2 decks, which resonate with superior class and grandeur.Each cabin with ensuite window onto the ocean, and hot-water showers in conjunction with a porthole looking out from a bathroom. As soon as you board the Red Dragon, you will be surrounded by richly detailed woodwork handmade by Vietnamese artisans. Whether you are relaxing in the comfort of your own cabin, lounging on the spacious sun deck, or dining in the cozy restaurant, you will feel like royalty. With its classic sails, polished woodwork and refined Asian décor, the Red Dragon Junk offers an unforgettable ambiance of relaxed elegance. 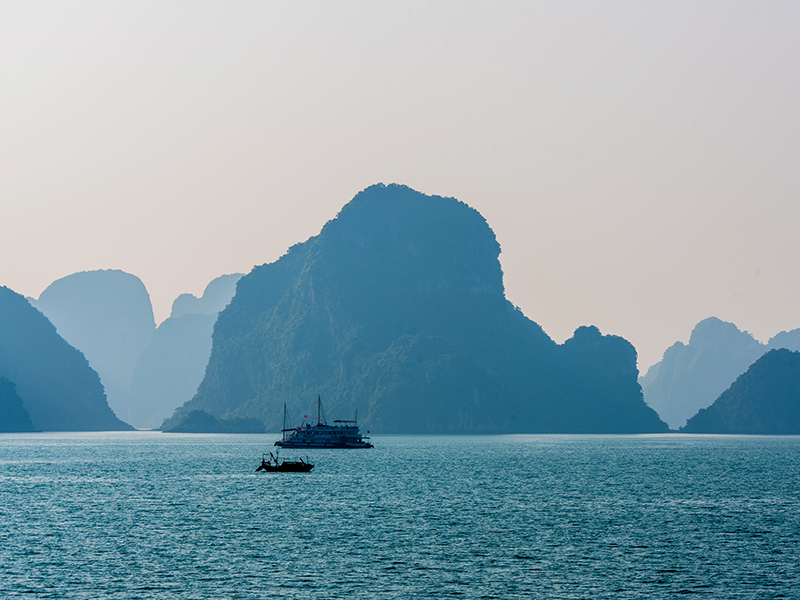 Aboard the Dragon’s Pearl, journey through the mysterious and beautiful Ha Long Bay in Vietnam. Launched in May 2010 by the Indochina Junk, the Dragon’s Pearl Cruise was designed with the theme of Chinese sailing junks, and an adventurousness in mind. In keeping with the tradition of wooden boat building, this masterpiece cruise is constructed of the finest quality materials by the hands of skillful craftsmen. Dragons Pearl, which there are a total of 18 twin/double fully equipped cabins; each air-conditioned cabin boasts its own bathroom with hot water shower. You would love the elegant design of the fine woodwork cutting through the architecture and interior decoration. Not to mention the luxurious dining room and bar, exquisitely designed with handcrafted Teak and Oak. This spacious area has 36 seats and is perfect for either a romantic dinner for two or family dining. To the rear of the deck is a cozy, covered lounging/dining area where you can enjoy the stunning views of Halong Bay through the elegant archways. As onboardingthe Dragon Pearl Junk,be charmed by her exquisite luxury, intimate setting and unrivalled home from home service. An unforgettable way to witness the serene, calm setting of Halong Bay’s exceptional natural beauty. As the newest members (comprising two cruises) of the Indochina Junk fleet, Dragon Legend Cruises arebuilt on a steel frame at highest safety level, the ship sets standard of safety in accordance to provide an amazing cruise experience. Dragon Legend Cruise offers a luxurious cruising experience with a strong commitment to service quality and accommodation. Each of 24 spacious cabins is a masterpiece of artwork equipped modern facilities. Our luxury accommodations have been artfully crafted by Vietnamese cultural symbols to make you stay comfortable and warm. All other public use areas including outdoor and indoor restaurants, bar, seawater pool, spa… at the same top-grade tone will transform your stay into an extraordinary experience.It is not only a state-of-the-art cruise but also the heart and mind of Indochina Junk’s management board who have put so much effort into making it a reality. Exploring Halong Bay deserves an amazingly cruising boat to stay. All the design features, itinerary and activities on board are customer oriented. 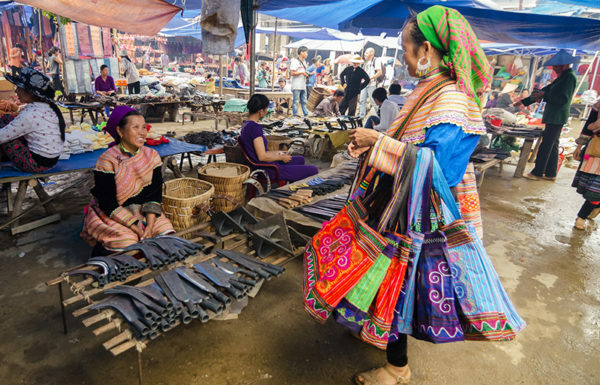 The mission of Indochina Junk Company and the Dragon Legend cruise is to offer trips to Bai Tu Long Bay in the less touristed area so the itinerary has been well researched to lead you far off the beaten track. Dragon Bay is a traditional wooden boat, which recalls the memory of a traditional sailing boat among thousand limestone islands to take you to the majestic land of sea and stone. Being a small size boat to accommodate maximum group of 12 persons joining or hire a private boat, Dragon Bay delivers a well catered experience to every single guest on cruising and exploring Halong Bay. In fact, its elegant shape makes it one of the most beautiful boat for day trip excursion, only at the Indochina Junk. The traditional boat features both a spacious outdoor dining area on the second floor and a warm indoor restaurant, added by second floor sundeck for the best bay view, relaxing lounge, cabins, other functional area (fully equipped bathroom, luggage area…) and a cozy spa to serve you in comfort. With a limited time cruising the bay, we treasure every minutes of your time onboard to treat you in high service level and warm caring at details. Currently managed by the Indochina Junk,however, in fact, this cruise was built by Italian ship master-makers at the end of 20th centuries. Looking from outside, the cruise is similar to the trading ship of Southeast sea, while the internal design gives you the feeling of a Mediterranean wine room. Along with Dragon Bay cruise, the Nang Tien cruise will serve day tours and half-day tours in Bai Tu Long area – the less crowded part of Halong Bay. Even now, Bai Tu Long remains an extensive unexplored area. In some ways, it is more stunning than Halong Bay, since it is only in its initial stages as a destination for travelers.